■ Adjustable torque setting by twisting the grip. ■ Built-in click mechanism to indicate when torque setting is reached. ■ Range: 2 – 24 Nm. ■ Durable hard shell box contains: - Torque tool. - Hex keys 3, 4, 5, 6, 8 and 10 mm. - T25 torx. 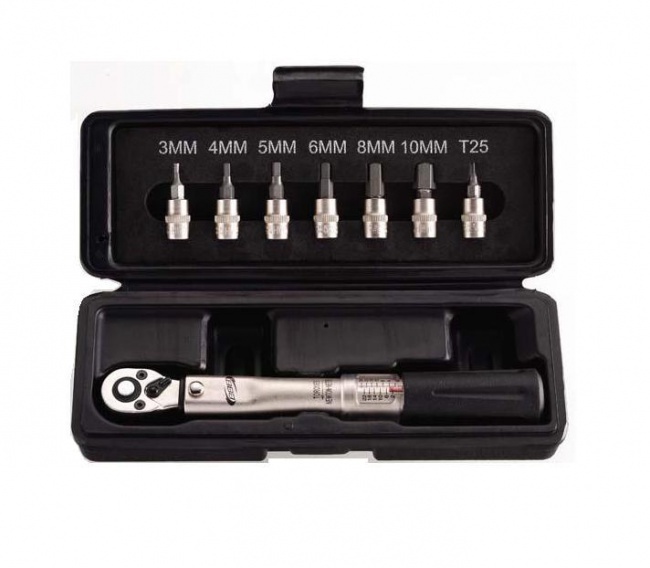 BBB Bicycle BIke Adjustable Torque Wrench BTL-52. ■ Adjustable torque setting by twisting the grip. ■ Built-in click mechanism to indicate when torque setting is reached. ■ Range: 2 – 24 Nm. ■ Durable hard shell box contains: - Torque tool. - Hex keys 3, 4, 5, 6, 8 and 10 mm. - T25 torx.